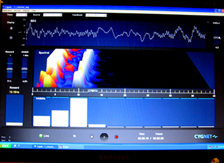 Neurofeedback is also called EEG biofeedback. The electroencephalogram (EEG) is another name for the brain wave recordings and, in this context, biofeedback refers to the process by which you learn to change your brain waves and thereby gain better control over your brain states. With Neurofeedback we target bioelectrical functioning of brain which is actually a more important issue than the “chemical imbalance” that is often talked about. We are concerned with the brain’s internal regulatory networks, and we train the brain’s functional disregulation. Simply by detecting the brain going off track through the EEG, we can train the brain toward enhanced stability and improved functioning. In other respects, Neurofeedback is somewhat like putting the brain on a stair stepper to exercise certain regulatory functions continuously. This is applicable to a wide variety of functional deficits. In the case of organic brain disorders, it is a matter of getting the brain to function better rather curing the condition. When it comes to problems of disregulation, we would say that there is not a disease to be cured, and self-regulation may very well be a complete remedy. Individuals of any age can benefit from EEG training. Neurofeedback can help a variety of childhood problems including bedwetting, nightmares, attention deficits and other forms of disruptive and disturbing behaviors. Neurofeedback can assist adolescents who struggle with anxiety and depression or drug and alcohol use. For adults, Neurofeedback can alleviate symptoms of physical and emotional problems such as migraines or PTSD Neurofeedback can help anyone maintain good brain function as they age. Peak performers also use EEG training to enhance their abilities in sports, business and the arts. Sensors are attached to the scalp with EEG paste which then pick up brain waves. It is painless and does not involve the application of any voltage or current to the brain. So it is entirely non-invasive. A computer processes the brain waves and extracts certain information from them. We show you the ebb and flow of your brain waves, and the specific information we obtain form them, in the form of a video game. We instruct you how to play the video game using only your brain waves. (Everyone can do it) The specific brain wave frequencies we reward and the sensor locations on the scalp are unique to each individual. With successful Neurofeedback training, medications targeting brain function may no longer be needed, or they may be needed at lower dosages, as the brain takes over the role of regulating itself. It is important for clients to communicate with prescribing physician regarding Neurofeedback and medications. What is AD/HD (Attention Deficit/Hyperactivity Disorder)? Attention-Deficit/Hyperactivity Disorder is one of the most common neurobehavioral disorders. Some inattentive and hyperactive-impulsive symptoms that cause impairment usually presented before age 7 years.